He isn’t old enough to drive a car or drink a beer or vote but Michael Perham has already made history twice. 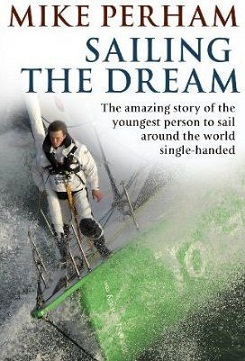 In 2006, aged just 14, he became the youngest person to sail across the Atlantic single-handed. Just two years later, in November 2008, Mike set off on the journey of a lifetime – to become the youngest person to single-handedly circumnavigate the globe. Since then, he has faced the terrifying might of the Southern Oceans and dozens of life-threatening hazards. Mike’s been knocked down and turned over by huge rogue waves in the Southern Ocean, he’s swum under his boat in high seas to free his rudder and climbed to the top of his mast in a storm to make vital repairs. 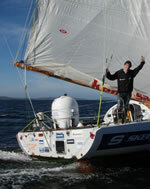 Mike has sailed through all of these crises, as well as coping with various injuries, illnesses, loneliness and fear. He has shown that even when pushed to the limit, he has extreme physical and mental endurance in quantities that very few people possess. Mike also proved he is an exceptionally skilful sailor – during his incredibly fast crossing from Cape Horn to Hobart, he covered an amazing 300 miles a day for three days straight. This 30,000-mile journey has also been one of growth, both mentally and physically (Mike turned 17 while on the trip). Mike’s reflections, introspections and observations capture his love of life, sailing and the ocean and its marvels, from ‘moonbows’ to the whales, dolphins and birds that joined him on his journey and from the horrors of pollution to the fear of failure and his family’s possible bankruptcy. Dangerous Seas is the truly heroic tale of the emergence of a new Great British sporting prodigy. It is also the incredible story of a family that shared the same fantastic dream, a dream upon which they have staked everything.